President Rivlin opens 'Beyond Duty' exhibition in France, telling the story of diplomats who saved Jewish lives during the Holocaust. 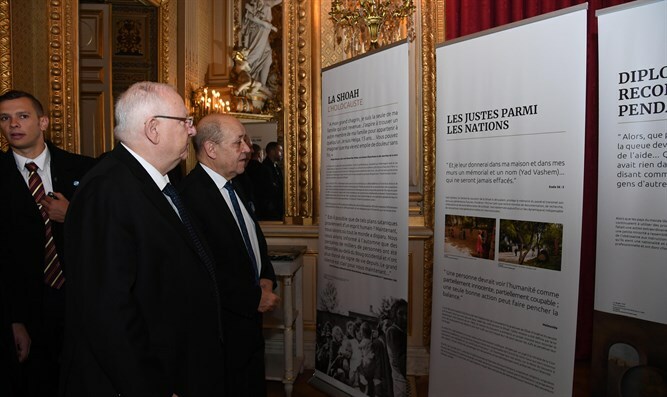 Ahead of International Holocaust Memorial Day on Sunday, President Reuven Rivlin today, Thursday, opened an exhibition called ‘Beyond Duty – Saving Jewish Lives and Showing the Way’ as part of his official visit to France. The president was accompanied by French Foreign Minister Jean-Yves le Drian. The exhibition shows the stories of diplomats who saved Jews during the Holocaust and is a collaboration between the Israeli Ministry of Foreign Affairs and Yad Vashem. The exhibition is being displayed in Israeli diplomatic missions around the world. During the Holocaust, because of their relatively wide-ranging powers, diplomats had the authority and the powers to decide the fate of many people. Some 36 diplomats in around 20 countries, recognized as Righteous Amongst the Nations for their actions, did so and saved an estimated 200,000 lives.